M.P. 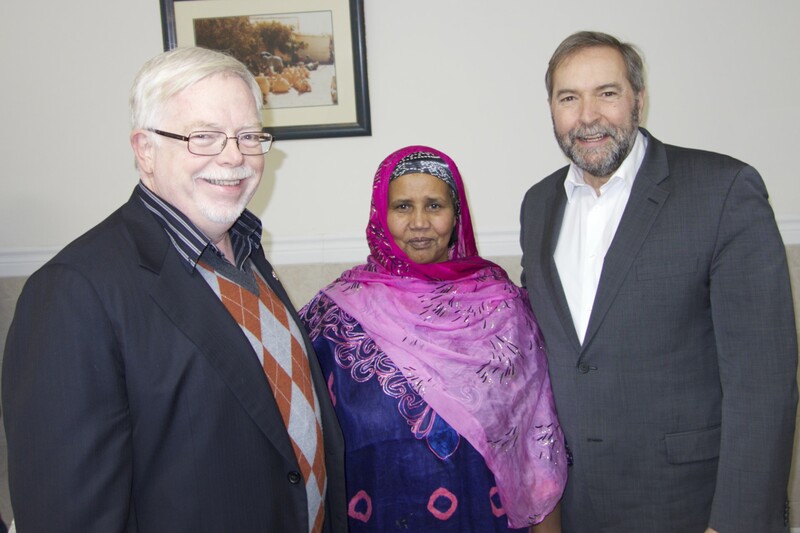 Mike Sullivan, Wiff owner Asha Ahmed, Opposition Leader Tom Mulcair. MP Mike Sullivan and Federal Opposition Leader, Tom Mulcair hosted a small business round table on Wednesday, February 11th, inside Wiff Restaurant, a Somali fusion eatery on Weston Road. According to Mulcair, small and medium sized businesses are responsible for 80% of new jobs in Canada, hence his election year push into Weston to gauge the mood of Weston’s entrepreneurial community. He acknowledged that these are very tight times for small businesses in the GTA. Mulcair is promising to lower the small and medium business tax rate from 11% to 9%, along with an accelerated capital cost allowance. He claimed that the Conservatives have reduced the tax burden for large businesses to the tune of $15 billion. ‘The rich are getting richer and the poor getting poorer’, he declared. A wide variety of enterprises were represented included brewing, urban farming, book selling, money transfer, dry cleaners, chartered accountancy and store-front businesses. The common thread of comments seemed to be how hard it is to operate a business here in York South-Weston, especially when such difficulties are compounded by rampant obstructionism from all three levels of government. There seems to be a perception of super efficiency when it comes to enforcement of rules and assessment of taxes combined with a reluctance to provide any service in return. Another business owner bristled against what seems to be a fixed Federal Government procuring process. Mention was made of store owners unable to afford fuel so they operate in cold buildings. Mulcair promised to look into the big banks’ refusal to work with companies that send remittance monies overseas. Only one bank deals with remittance companies but apparently charges outrageous rates. Many business owners expressed the concern that until they make a profit, they won’t be paying any business income tax. I heard afterwards that one city inspector is presently making things difficult for at least two Weston businesses while others endure irritants such as excessive development charges and bloody-minded nit-picking. The entrepreneurs seemed to agree that more is needed to help businesses thrive along with less red tape and a reduction in municipal and provincial taxation. Federal business tax reductions won’t help struggling businesses. Nine percent of zero is still zero. Oh yes, citizens of Weston we can help: if you want a vibrant walkable shopping district, support local businesses. Buy Local.